LAist had the chance to talk to Academy Award-winning actor Timothy Hutton as he was on promotional tour for his new TV series on TNT, "Leverage", which premieres on Sunday, December 7th, at 10:00pm. "Leverage" is an action-thriller which stars Hutton as the ringleader/organizer of a team of high-tech former criminals who target powerful exploiters of those who are powerless, Robin Hood-style. This marks Hutton&apos;s return to TV after NBC&apos;s "Kidnapped" was cut short in 2006. Hutton started his career in television over thirty years ago before taking on the Oscar-winning role of Conrad Jerritt in Ordinary People in 1980, embarking on a career that has included many other excellent films such as Taps, The Falcon and the Snowman, and Kinsey. In 2001, Hutton became executive producer, director of several episodes, and the protagonist of the A&E series "A Nero Wolfe Mystery", becoming a leader in bringing high production-value, original drama to basic cable. "Leverage" brings Hutton back to basic cable in what appears to be a well-produced series for TNT- what is now an expected phenomenon in a trend Hutton helped start almost a decade ago. LAist: How has working with TNT on "Leverage" been different from your experience doing the "Nero Wolfe" series on A&E? Timothy Hutton: "Nero Wolfe" wasn&apos;t set up to be a series on A&E, our idea was to do these books by Rex Stout as 2-hour movies because that&apos;s what they lent themselves to. We did one and it did really well, so they asked us if we wanted to do more, so we did a few more, and then we discovered some [Rex Stout] books that would work as 1-hour pieces but it was never set up as a series. Each piece was supposed to be a separate work. When I decided to do "Leverage" it was the first "traditional" series for me, I had to agree to be on it for 5-years should the show progress that far and I thought it was a great script was and it was an interesting way to start off with a character who had hit rock bottom and the only way he could pull himself out of it was through the psyche of helping people and going after those who had been ripping off others. LAist: Your character, Nathan Ford, has some character flaws, how are those going to be explored over the season? Timothy Hutton: The first season will show a range of Nathan being seemingly stable and ok and having found this new way of getting on with his life to completely falling apart and being pulled back into the tragedy of his life, when he lost his son. The drinking remains a problem for him and he gets confronted about it by the other members of the team. LAist: You mentioned the team that Nathan assembles. There are other shows out there that have these high tech teams but one thing I noticed about "Leverage" is that there's brevity, these other shows are so damn serious, nobody cracks a smile, but with Nathan's crew there's humor, is this consistent throughout the season? Timothy Hutton: That continues very much so. Some of that is driven by the characters that the team members have to assume as part of a con. Some of these characters and personalities get further developed, like a loudmouth card-shark that I play, the team also takes over a movie set to con a woman, an aspiring actress, who has been running a corrupt child adoption agency in Serbia and that's very funny. We take over a wedding and Nathan steps in as the priest who was supposed to preside over the wedding. There is humor, the team has fun in what they're doing, sometimes things fall apart as they are apt to do and they have to resort to plan B. It's what was appealing to me, I didn't want it to be taking itself too seriously, I didn't want to be part of some kind of crusaders sticking it to the man. LAist: Are you thinking about directing any future episodes of "Leverage"? Timothy Hutton: I certainly didn't think about doing it for this first season because we had so many great directors lined up. It doesn't mean I don't want to do it maybe down the road, but I think I've done that, where I'm playing the role and I'm directing, and it's a lot to take on. I think if I were to direct again for television, it would be for a series that I wasn't acting in, where I'd be an executive producer, directing every now and then, and developing story lines. LAist: I think your "Nero Wolfe" series really brought high-quality shows to basic cable, it was one of the first to do so. 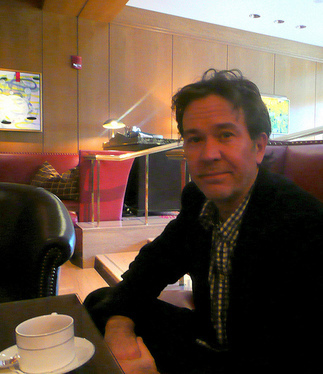 Timothy Hutton: I think so, but I sure have never read that anywhere or heard anyone say that. It really feels, and I don't want this to come like I feel that the show was underappreciated, but it really was in its own vacuum. Those shows were very carefully put together, everything from the cinematography which was beautiful to the idea of a repertory cast - I just don't think that many people picked up on that, and I do think it laid some groundwork. LAist: Certainly many shows followed the series that we are now familiar with, like "The Shield", etc. Where do you see things going from here, will there be more stuff done on the 'net? Timothy Hutton: I think more things are going to be done on the 'net but I think it's going to be a bit of a rocky road. You need to have high speed gear and a connection to watch a program and it isn't anywhere near the same quality that you have when you watch it on TV even when you go through your TV off of the Internet. I think it's definitely the next frontier, you know, for tuning into serialized shows. I think that reality TV will continue to be a big part of programming on the Big Three. I hope it's not the case, but the economics, the business model for those kinds of shows is that they are such low risk, and it's such high risk for a show like Christian Slater's show, which is a really terrific show, but the network looks at it and thinks it's a really expensive show that has an effect on other things they have in development. But if a reality show doesn't work it doesn't have an impact on the next guy who comes in to pitch another reality show. Timothy Hutton plays Nathan Ford in "Leverage", premiering on TNT, Sunday, December 7th at 10:00pm.